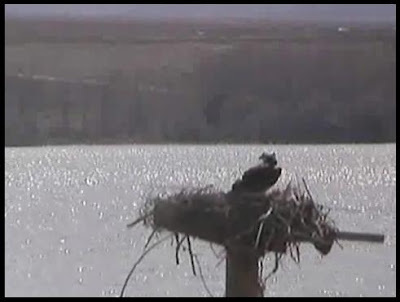 There is now a live webcam on the Osprey nest platform at Deer Flat National Wildlife Refuge with Lake Lowell in the background. Click on the image to watch. The image is a bit too distant and grainy, but still very cool! You can watch downtown Boise's peregrine falcon nest box cam too! Click on the image to there. Last night, while Kyle was at Cub Scouts, Jessica and I took the girls for a walk along the Boise River near the Eagle River District area. We watched an Osprey on the platform and another was eating a fish. After eating on the fish for a few minutes, it flew to the platform, gave the fish to the other Osprey, and that Osprey took the fish to the eating-tree. Very cool to see, especially for my little girls.